A postcard of the Milan Cathedral from 25-year-old Agnes Mary Kitchen to the Reverend R. B. Layton in San Fernando, Trinidad, B.W.I. 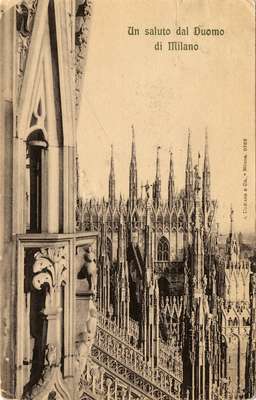 The Milan Cathedral, in Milan, Lombardy, northern Italy, was begun in 1386 and completed five centuries later in 1965. Bought this card half way up the Cathedral tower and had it stamped. It is a magnificent church. We went clear to the top 485 steps. There are over 2000 statues on the outside of the building.